Page added in July 2010. The winding tracks leading to many villages of Northern Syria can hardly be regarded as state-of-the-art roads. 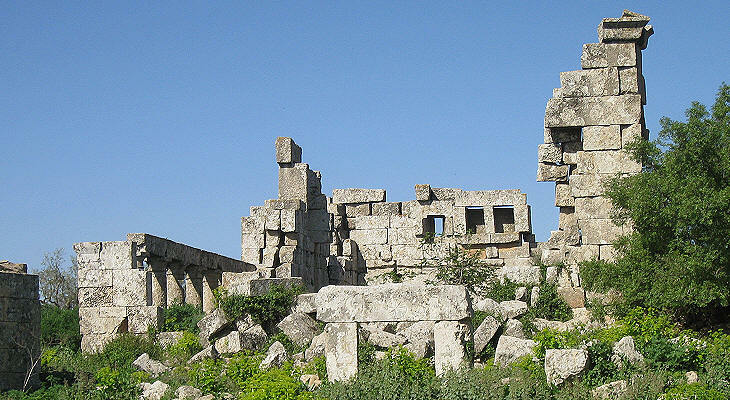 The access to the village of Brad in the limestone hills between the Afrin River valley and Aleppo, was improved in 2008 for the visit of a very important guest: General Michel Aoun, leader of the (Lebanese) Free Patriotic Movement. He visited Brad accompanied by Syrian Deputy Foreign Minister Fayssal al-Mikdad and Aleppo Governor Tamer al-Hijja. Visitors came to attend a mass celebrating the 1600th anniversary of the death of St. Maroun, who was buried in Brad, at his time a populous town. 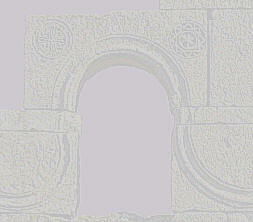 Theodoret, Bishop of Cyrrhus, the most important city of the region, wrote in his Historia Religiosa that Maroun lived a hermitic life with a small group of disciples; at his death in 410 several towns and villages almost fought for housing his tomb; according to the description of the site by Theodoret, it seems that Maroun was eventually buried in Brad, in a small chapel added to an existing large church. 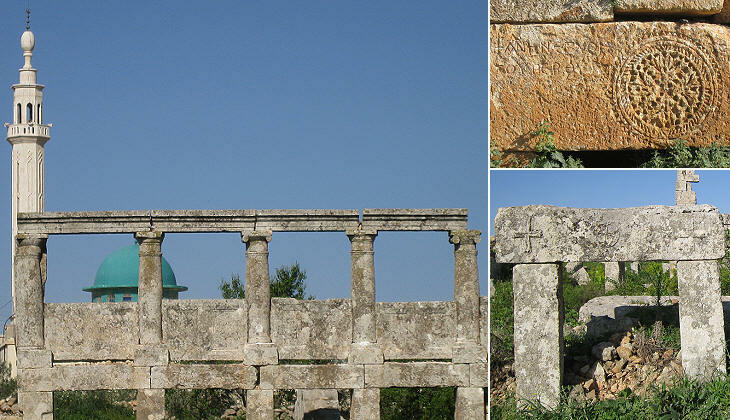 The large church of Brad quoted by Theodoret was built just a few years before the death of St. Maroun; it is named after one of the two architects (Julianos and Daniel) who are mentioned in an inscription found on the keystone of an arch. The church was built on the site of a previous temple and it is possible that some decorative elements of that building were re-utilized. Similar to other monuments of the region it was built by carefully placing together cut stones, without the use of bricks or mortar. 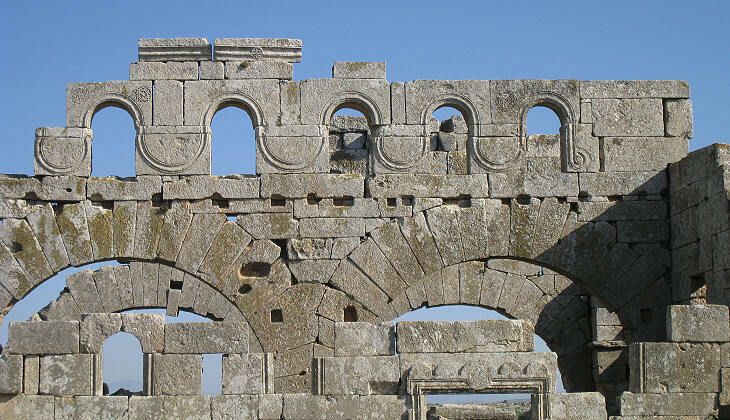 The church was built before that of Qalb Lozeh and it does not show major changes from the traditional layout of a basilica (a large rectangular hall divided into three naves by columns or pillars and with an apse at its end). 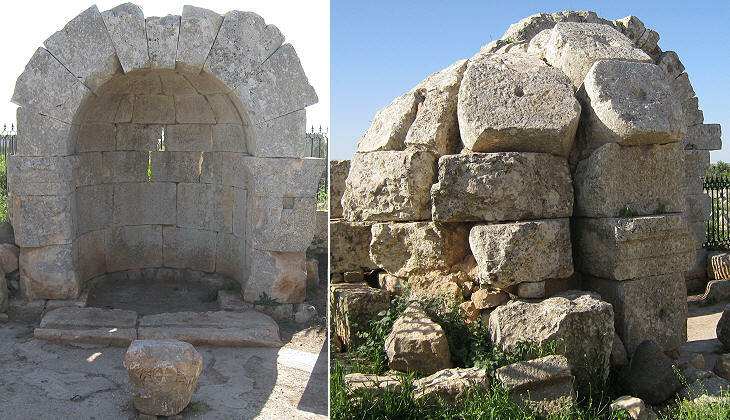 A second large church was built in 561 immediately to the north of Julianos basilica and the tomb of St. Maroun. It is possible that Brad had become a pilgrimage site, although on a smaller scale than the shrine of St. Simeon and that a second large church was required. Its decoration was rather limited, yet the pattern of linking together the windows with a curvilinear decorative band was developed further with a very novel design. When St. Maroun passed away in 410 he was certainly unaware of having founded a monastic order, which was established by his disciples in 452. On the debated issue about the nature of Christ, the followers of St. Maroun sided with the decisions of the 451 Council of Chalcedon which declared that Christ maintains two natures; for this reason many of them were slain by the inhabitants of Antioch, who supported Monophysitism (one inseparable nature); some monks who escaped the massacre sought refuge in the mountains of Lebanon. The historical development of the Maronite church in Lebanon is not entirely known; in the late VIIth century the Maronites appointed their own patriarch (St. John Maron) and over time they became the prevalent Christian church in Lebanon; in the XVIth century strong links were established with the Roman Catholic Church; Pope Gregory XIII established a church and a college in Rome for the Maronites in order to support their effort to maintain their Christian identity. You may wish to learn more about the Maronites by visiting the Official Website of the Maronite Patriarchate. The visit to Brad made by General Michel Aoun, a Maronite who fought Syrian influence over Lebanon for many years, was seen as a significant step towards the establishment of friendly relations between the two countries. 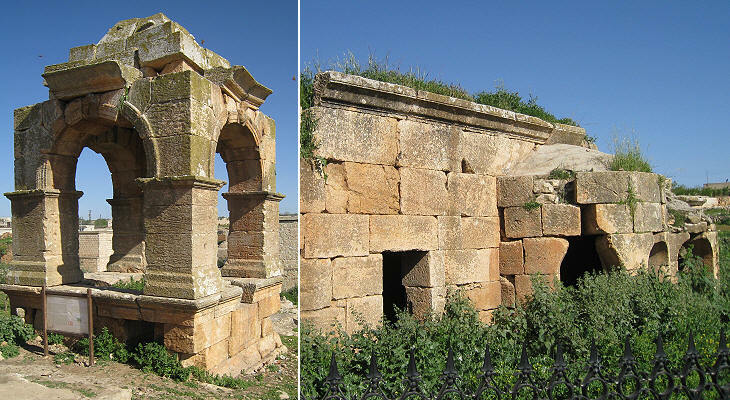 In addition to its Christian monuments Brad retains some earlier buildings the design of which is more in line with classical patterns; there is a funerary monument similar to a larger one at Cyrrhus and public bath facilities which show evidence of the use of mortar in the construction of the vaults. 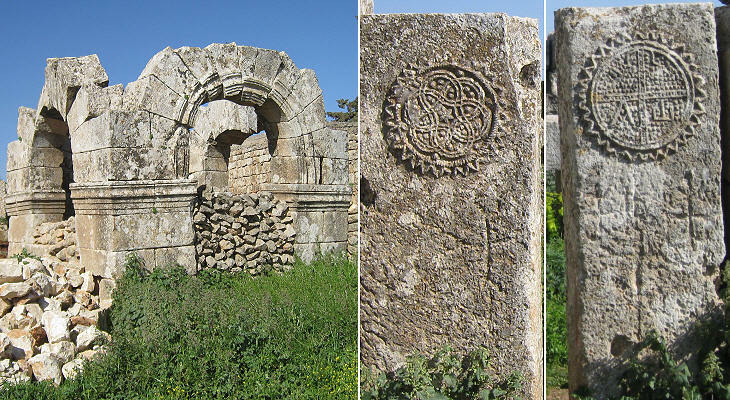 Depending on the adopted criteria, archaeologists have identified between 700 and 2,000 abandoned villages in the limestone hills of northern Syria; only those having buildings of significant interest from an artistic or religious viewpoint have been included in a separate archaeological area. 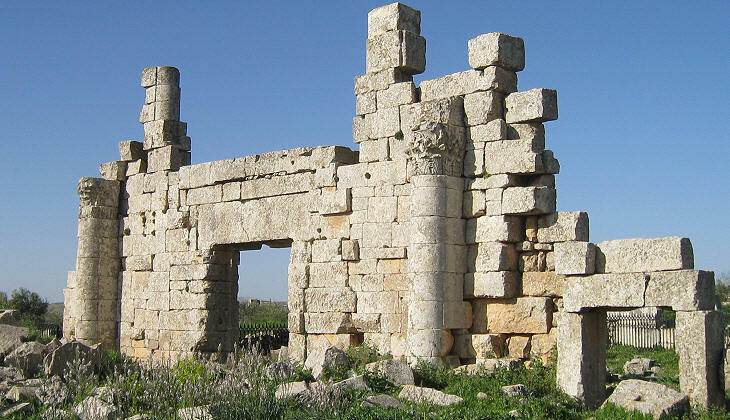 Brad was not an isolated town; it was located instead in a highly populated region and one can see several early Christian buildings along the road leading to it. Map of Syria with all the locations covered in this website.